To receive personalized information relating to Dental Care in Romania, you can scan your PANORAMIC RADIOGRAPHY, in jpeg format, and send the image via e-mail. Easiest way to get photos from digital x-rays is to take a picture of X-ray placed on a piece of glass with the light falling on the opposite side. 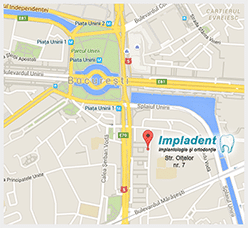 Soon receive a reply with a quote based on our rates inclusive of program work related to your dental care in Romania. Book your visit with no obligation, just call. It will be a pleasure talking to you.